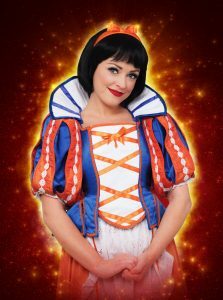 Cardiff’s own Stephanie Webber to play Snow White in this year’s enchanting New Theatre pantomime! The New Theatre has announced today that local singing sensation Stephanie Webber has joined the cast of this year’s pantomime Snow White and the Seven Dwarfs. Stephanie joins the previously announced stars Samantha Womack, Gareth ‘Alfie’ Thomas, Mike Doyle, Chico and Tam Ryan, playing the title role of the beautiful princess Snow White from 9 December 2017 – 14 January 2018. Having graduated from the Arden School of Theatre, Stephanie has gone on to appear on television and in numerous stage productions on land and sea across the globe including headline roles on board luxury cruise liners and last year continued her nautical career by starring opposite David Hasselhoff as Mimi the Mermaid in Peter Pan at the New Theatre having previously appeared with him on tour in Last Night a DJ Saved My Life respectively. In 2015 Stephanie auditioned for the BBC One talent search The Voice, receiving the fastest reaction from will.i.am upon hearing her spectacular singing voice. Throughout her stint on the competition Stephanie was mentored by Tom Jones and she continued to wow the judges and audiences alike with her winning personality and stage presence. In 2016 Stephanie also starred alongside Charlotte Church in her 2016 Festival of Voice production The Last Mermaid in Cardiff. Stephanie joins Samantha Womack as The Wicked Queen, Gareth ‘Alfie’ Thomas as her Henchman and X Factor star Chico as the handsome Prince. This year’s pantomime will also see Stephanie reunite with Mike Doyle (the Nurse) and Tam Ryan (Muddles) having starred alongside them in Peter Pan and Last Night a DJ Saved My Life. Staged once again by Qdos Entertainment, the world’s biggest pantomime producer, and the team behind the annual New Theatre panto, Snow White and the Seven Dwarfs will feature all of the traditional pantomime ingredients Cardiff theatregoers have come to expect in a fantastic new production of the well-loved fairy tale. With over 25,000 theatregoers already attending this year’s pantomime, audiences shouldn’t leave it any longer to book for the fairest panto of them all. Snow White and the Seven Dwarfs runs from 9 December 2017 until 14 January 2018. Tickets are available from www.newtheatrecardiff.co.uk or from the Box Office on 029 2087 8889.